Sometimes outdoor lighting is installed on high light poles. We have bucket trucks available for these types of fixtures. Enhance your safety and security by keeping your outdoor common areas, pathways, and parking lots illuminated. 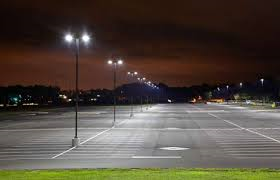 Click here if you need to install or repair any outdoor or parking lot lighting.